The boys were still quietly getting along and Ian had switched to watching Yukon Men. He's completely obsessed with the idea of living off the land and I'm starting to think that one day he'll head to Alaska to see what it's all about. It was 10:30 and I was feeling pretty guilty that it was Wednesday and we had yet to start school; our only day of school scheduled for this week! We assembled at the table and I pulled out our first postcard that we received last night. The swap officially started today but one eager family sent theirs out last week and the boys were so excited to see that in the mail last night. 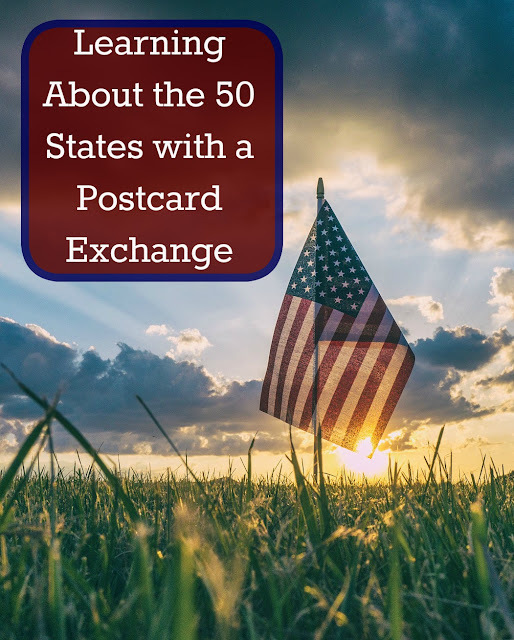 A homeschooling mom set up a 50 state postcard exchange Facebook group and divided each of the regions of the United States into 12 groups. We write out a 4 postcards a month for 11 months and 6 postcards one month until we've gone through all 50 states. It works on a rotating schedule so group 1 mails to group 2 who mails to group 3, etc. on the first month and then the second month group 1 mails to group 3 while group 2 mails to group 4, etc. It should be so much fun! I had promised we could sit and read it this morning as we started school. Not one to break my promises, we read all about the state of Washington and studied the picture on the front. Alec loved hearing that their state animal was the Orca whale. I pulled out the sample post cards the boys had written up the other day and asked them each to pick two postcards to copy their sample onto. I wrote all 6 address onto the cards and ended up writing up Evan's two postcards. I realized he was never going to be able to fit his words into the tiny little boxes on the cards. Ian wrote so small he actually added a few more sentences onto his cards. The older boys wrote first in pencil, had me correct/ check it, and then went over their words in pen. I promised to buy erasable pens for next month and I told them that this was the ONLY month they'd have to sit and write two postcards at once. Now that we have all the addresses we can fill them out at our leisure and just make sure to mail them on time. We talked about how addresses are written and where the stamp goes. Our plan is to study each state that we are receiving cards from each month... though I did mess up and accidentally ordered books for the states we are sending cards to this month. I am hopeful that at the end of the year we'll have a good idea about what life is like in each state of our county.